Homepage / autos / The 5000-hp, 300-mph Jet-like Devel Sixteen is Finally Here! The 5000-hp, 300-mph Jet-like Devel Sixteen is Finally Here! The company had initially announced that its engine was made from scratch in the US by Steve Morris Engines. However, it seems that they have recently formed a partnership with Manifattura Automobili Torino to work out their kinks and make the engine/car a reality. 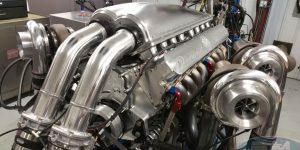 The company has boasted that the car will put out 5,000 brake horsepower with its 12.3-liter Quad-turbo V16 and will reach top speeds around 350mph. They also say that the Devel Sixteen is capable of going 0-60 mph in 1.8 seconds. When they went to test the claims, the dyno that they had tested on could only withstand 4,515 horsepower before crapping out, so there’s no definite evidence that it lives up to it’s promises. If the company is able to squeeze the full 5,000 horsepower out of it’s motor, it’s hard to say if they’ll be able to live up to their second promise of speeds around 350 mph, considering the car’s unprecedented aerodynamics and heavy weight of over 5,000 lbs.